Etymologically, obscurity signifies “darkness; absence of light”; oscuro in Spanish. I personally don’t find any negative connotations to this word—I relate it to chiaroscuro; degrees of light within the darkness of shadows; contrast. I see obscurity as an area where ambiguity of sorts can take place… where one cannot see an object in full. …I am usually not very interested in music that attempts to trigger effortless, straightforward communication. My guess is that obscurity allows my listener persona to be—to a certain degree—free from passive means of acquiring some sort of signification. In other words, I want to have the ability to choose, to be able to independently develop the circumstances where meaning can emerge. I want to be able to actively create while listening. 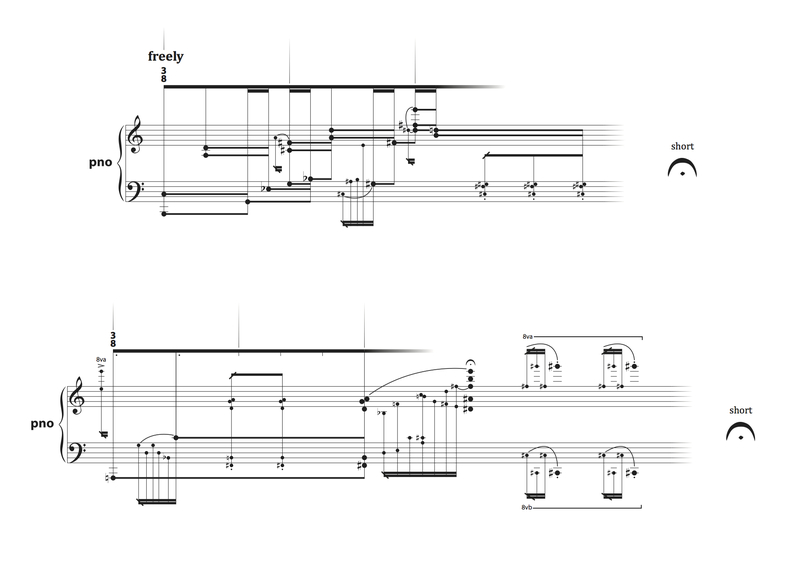 Andrew’s Jeku(ii) for violin and cello (2011) functions as a paradigmatic example of this approach. The piece presents a highly complex perceptual experience, especially when it comes to the relationship between its non-linear form (or should I say broken linearity) and both the diversity and instability of its sonic materials. Jeku(ii) lies right onto the line that separates a listening experience entirely focused on the present moment from one that is concerned with how the present moment relates to its past and potential future. Its formal configuration forces me to constantly reevaluate where I am in the piece (something I love doing). Page 13 of the score introduces an event that only takes place once throughout the whole work. The violin repeatedly produces a series of muted clicks. It is as if, suddenly, one can finally glance at the big picture: the scale between chaotic/unforeseeable relationships and extreme consistency has been defined. It is fascinating how such a banal material can obtain this magnificence, all because of the carefully designed context surrounding it. A question that consistently comes to my mind when listening to Jeku(ii) is: did this already happen? Or maybe: did this already happen, with the addition of a previously unheard degree of interactivity? Or even better: this has actually not happened. It is this quality of not-knowing-for-sure, of having to approach one’s own perception speculatively, that excites me every time I listen to it. Like many other great musical works, listening after listening, I never get to fully grasp how Jeku(ii) relates to my experience—it always offers something more. Christopher Fisher-Lochhead and I are colleagues at Northwestern—that’s how I got to know his work. This past fall, ensemble recherche premiered his piece megrims (2013), for oboe, bass clarinet, viola, cello, and piano. megrims is another one of Chris’ little jewels, another addition to a list including Ermine (2013) for solo violin and Shredhaus (2012) for solo amplified classical guitar. A set of five miniatures, megrims explores the mechanisms of dichotomy (two of the miniatures are titled Ghost in the Machine). For example, movements 2 and 4 contain high rhythmic specificity, while the rhythmic nuances of movements 1, 3, and 5 are almost entirely up to the performer. 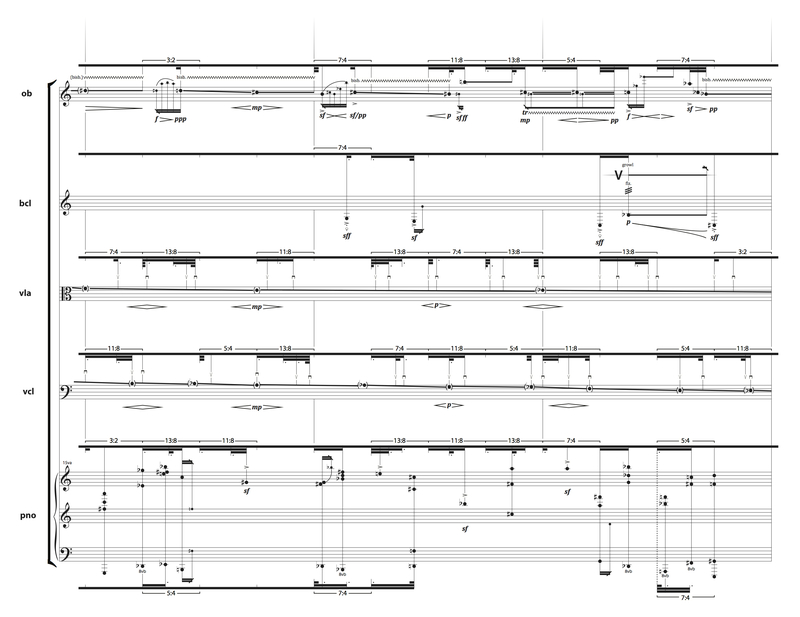 Furthermore, some sections of the piece are highly linear in nature (such as the lamento glissando on the strings in the second movement) while some others tackle issues of dimensionality and interjectionness (as in the third movement, in which the piano interrupts the previously developed linear flow and pushes for a less teleological perceptual situation). Despite such a traditional formal approach (megrims is a type of arch form [ABCB’A’]), the piece is capable of creating a sonic environment where memory plays an essential role. When I listen to it, I feel as if I was carefully looking at a block of pyrite—I can see myself looking at the mineral as a result of my reflection on the sides of the cubic rock, but I can also see how both the texture and color of each crystal transform in relation to light changes. Listening to megrims feels as if two independent timelines were created. On the one hand, there is the objectively measurable timeline, in which sounds change over time. On the other hand, a separate, highly unique timeline—although I’d better call it area—that is perceived subjectively emerges from the whole experience, thus allowing me to go back and forth through my own memory of the piece while it is still running. In other words, while the last miniature is still taking place, not only can I relate its sounds to those that happened earlier, but I also have enough mental space to delight in the beauty of the present moment—this I find remarkable. It is quite fascinating that a work that attempts to explore dichotomy via its own form and materials ends up triggering the aforementioned temporal duality to someone’s perception (me in this case). This is yet another reason Chris knows exactly what he is dealing with—and I’m glad I can experience it.